Paragliding has been off my agenda this year. Mainly due to over work and stress induced apathy, I’d almost forgotten I could fly. 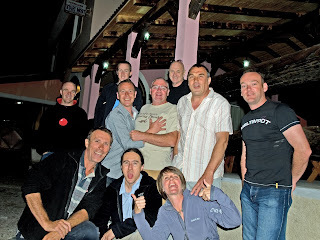 Well, after being rude to a customer (a first in 23 years), I realised I needed a break, so I joined up with a group of pilots going for a week in Montenegro, with Dean Crosby of Active Edge. The last minute plans are always the best and this was no exception. A nice villa, designed for boarding groups of pilots and owned and run by a Paragliding Instructor, nestled above Budva, was the perfect place. The mountains are accessible and within an easy glide to a beach, so all was well. An ex alcoholic who happened to be a comedian, marketing guru and internet entrepreneur. The MD of an internet service provider, who hadn’t let his success force him into a suit and wore his long hair ‘Apache’ style and loves air guitar, when sloshed. A bricklayer, who is easily the most enthusiastic person I’ve ever met, whether talking about Paramotoring, headscarves or the delights of rum and coke. The MD of an electrical contracting firm, an all round nice guy, brought up by gypsies around Doncaster before creating a new business life in the south. A Scottish academic with the brains of, ‘Brains’ from thunderbirds. An engineer and his misses who were travelling Europe in a camper van, flying anywhere they could. A builder, specialising in restoring listed building, he has a smooth and slightly camp delivery, polished off with a perfect public school accent. A mix of other remarkable types…. …and me; middle aged and stressed businessman with clinical depression and a penchant for schoolboy humour; when drunk. After a year off I though flying might be a challenge but it really is a simple thing – I fell right back in the harness after one flight, spending the rest of the holiday practicing my wingovers and other dynamic moves– no decent was the same. Evenings were spent taking the p**s and listening to the tales and jokes around the table. We all know what it’s like to laugh until your stomach hurts don’t we? What is it about free flight that attracts such a fine batch of complex and interesting types? I haven’t been snowboarding or skydiving, but I wonder whether the guys and gals involved in those sports are just as rum a lot, as I get to meet on paragliding jaunts.